Electrochemical systems containing nanostructured materials are increasingly being incorporated into devices for efficiently harvesting, storing, and converting energy. These nanoelectrochemical energy systems hold particular promise for enabling alternative transportation technologies, including improved batteries, electrochromic cells, photoelectrochemical cells for solar hydrogen production, fuel cells, and electrochemical supercapacitors. The goal of this project is to develop new tools and integrated measurement systems that can characterize the chemical and physical transformations that occur at the nanoscale in a variety of electrochemical energy storage and conversion devices. Transportation is the single largest contributor to U.S. carbon dioxide emissions. Moving to an electrically powered transportation system that draws on sustainable energy supplies has the potential to lower transportation costs, reduce greenhouse gas emissions, and help further reduce the nation's dependence on foreign oil. In order to switch to cleaner energy technologies for transportation, new technologies must be developed to extract and store energy at densities that can compete with petroleum. Incorporating nanostructured electrodes into electrochemical energy conversion and storage devices, including batteries, fuel cells, and supercapacitors, offers advantages for a variety of transportation and other energy infrastructure applications. In each of these devices, nanostructured materials can be used to increase the chemically active surface area within the same volume and mass, thereby increasing the energy density, power density, and electrical efficiency. Nanostructured materials also have the potential to improve physical robustness while lowering manufacturing costs. The fabrication and effective use of nanomaterials in electrochemical devices presents formidable challenges. Understanding and controlling the interfacial reactions and phase transformations in these devices requires careful measurements and a fundamental knowledge of how nanoscale surface composition, structure, and defects affect charge transfer in the devices' electrochemical solutions. 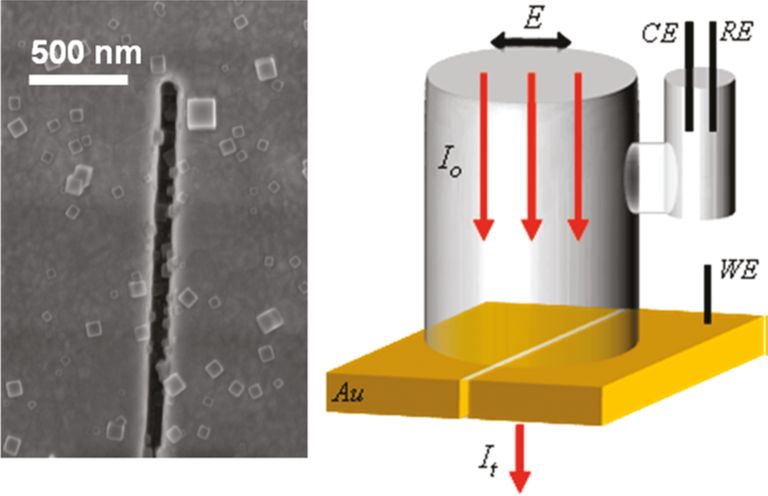 To address these challenges, we are combining scanning electrochemical microscopy with atomic force microscopy, Raman spectroscopy, and plasmon-enhanced optical spectroscopy. The information gained from this powerful combination of techniques is designed to correlate local electrochemical activity with morphology and chemical composition in order to clarify the underlying mechanisms of various electrochemical energy storage and conversion devices and help improve their performance. In a related effort, we are using plasmonic nanoslits and related structures to optically interrogate electrochemical reactions occurring at the nanoscale. The figure below shows nanocrystals of the electrochromic dye Prussian Blue deposited inside a plasmonic nanoslit. Transitions induced by electrically cycling the dye from an absorbing (blue) state to non-absorbing (white) states can be observed with much greater sensitivity using plasmons instead of cyclic voltammetry. Left: Nanocrystals of Prussian Blue inside a plasmonic nanocavity. Right: Schematic of an electrochemical cell for in situ optical spectroscopy.